A lesson to you all – beware of freakishly tall men in straw hats brandishing video cameras. 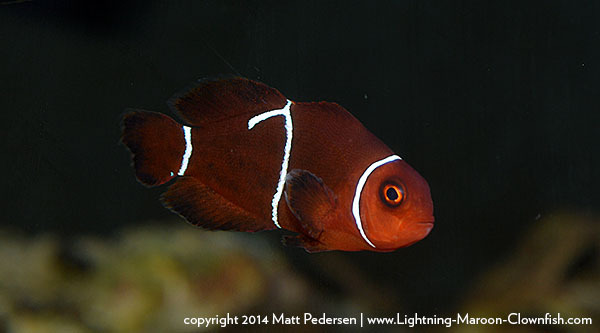 Come see ^ THIS GUY ^ give an epically animated talk this weekend at the 2014 Marine Breeder’s Workshop. Yes. It has Lightning Maroons in it. Thanks Kevin Erickson. That is all. 4 more offspring up for bid in a Blue Zoo eBay auction. 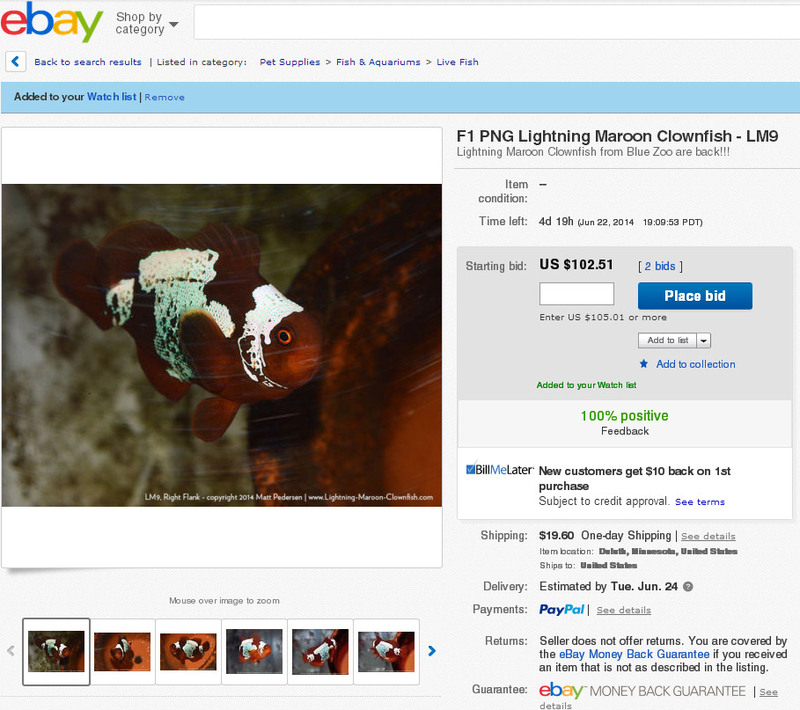 Over the weekend, Blue Zoo started up 4 more eBay auctions for a few of the remaining fish I have to offer this summer. 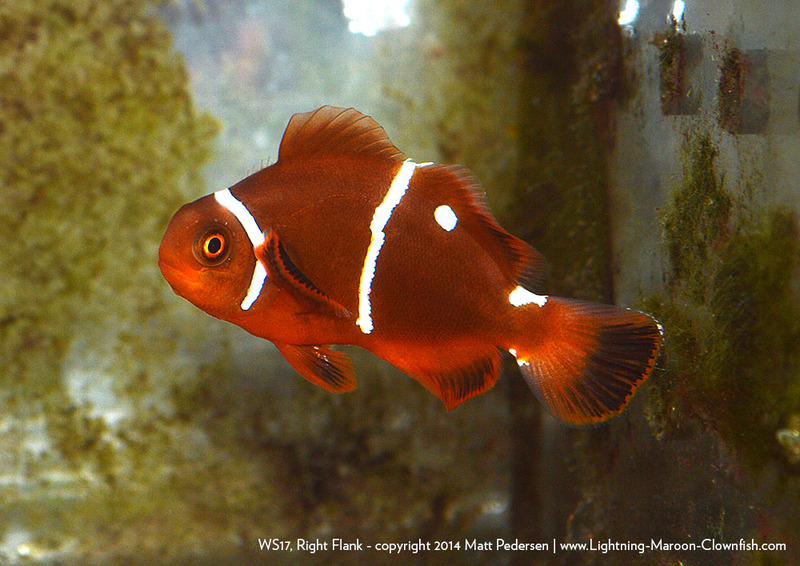 These include the last 3 available fish from the June 29th, 2012 hatch; WS11, WS4, and LM11. 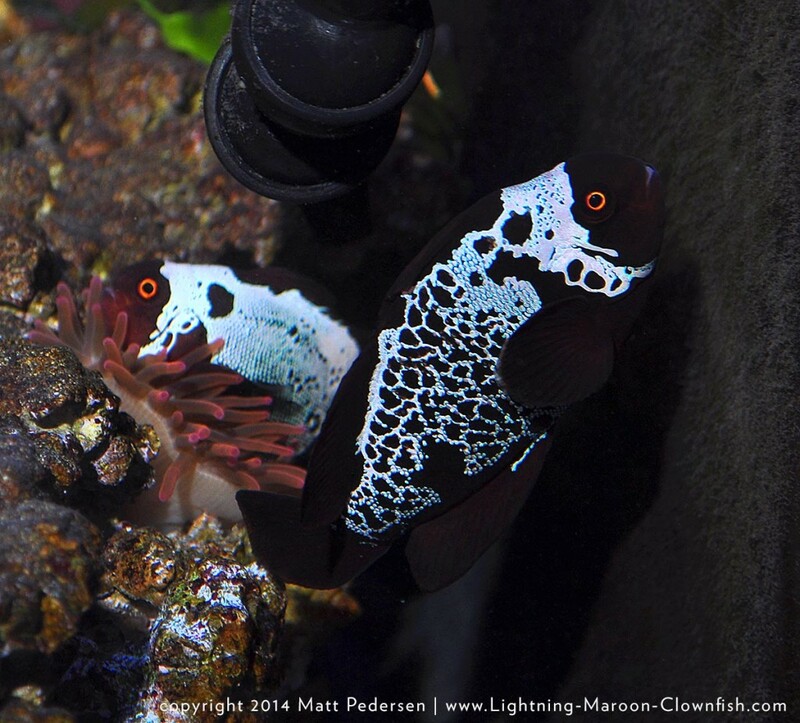 LM19 is from spawn #14, the 10-24-2013 hatch, and is one of the best offspring I’ve raised to date (in my opinion). 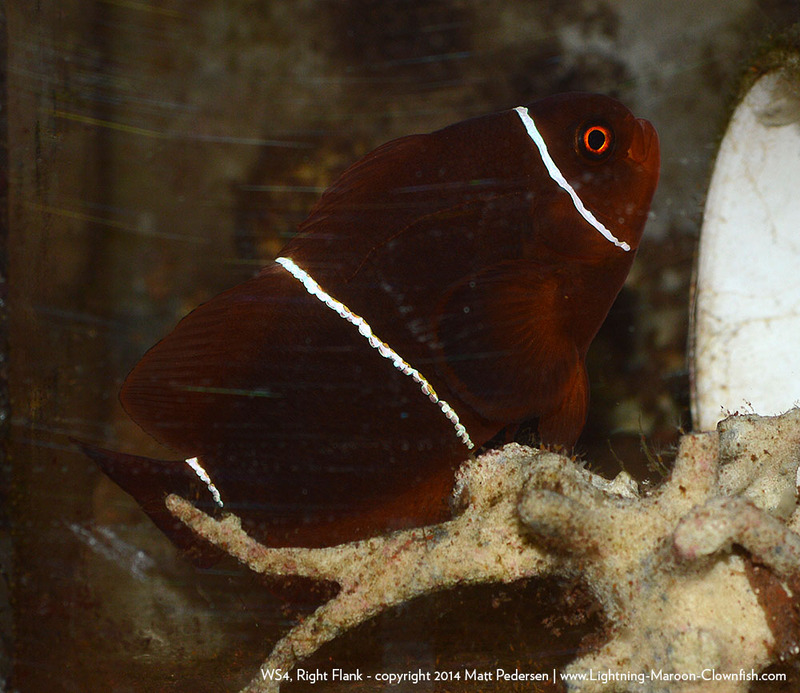 It is also a small fish at 1.5″, and would make an solid male in a pairing with a larger fish (of course, this is not without risks in trying to establish a pair). 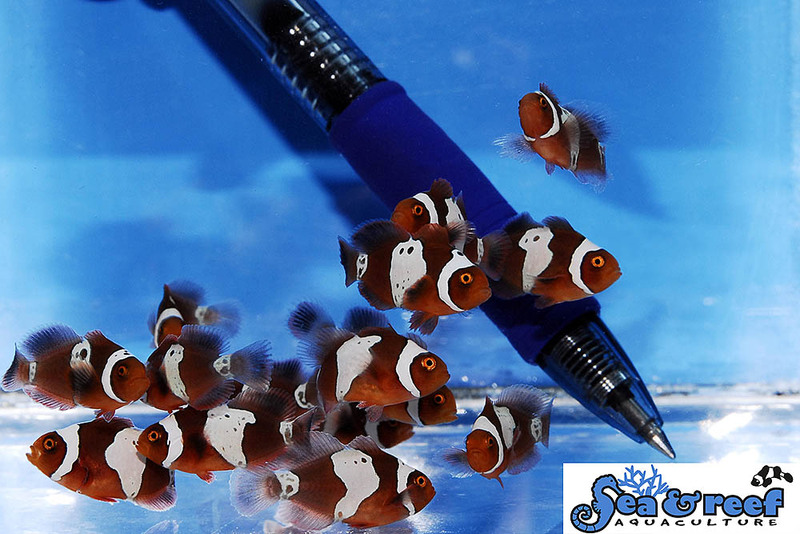 This leaves only WS17 and LM20 for possible future auctions this summer if we so choose; I won’t have more fish at saleable size until fall or winter of this year. 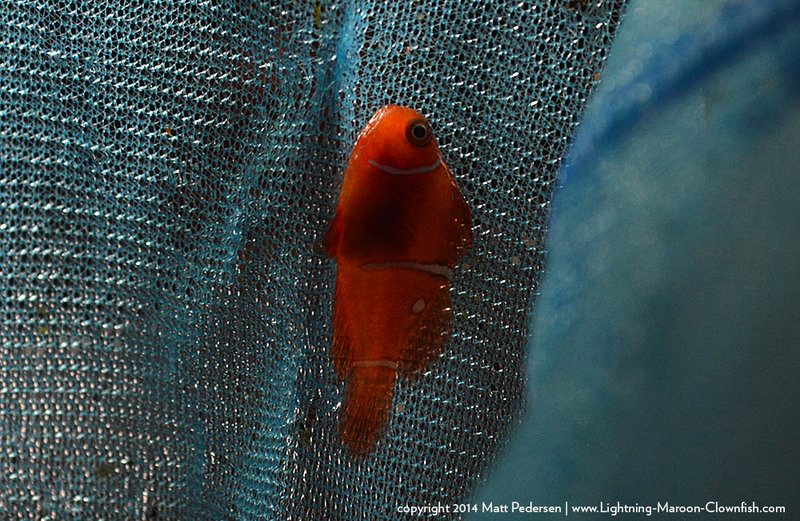 Spawn #27 came back to my fishroom on 6/20/2014, as Mike Doty has opted to do another run of Lightnings with spawn #36 (update on that as of 6-30, there were only about 10 that made it from Spawn #35 – Mike had some hatching issues this time ’round). 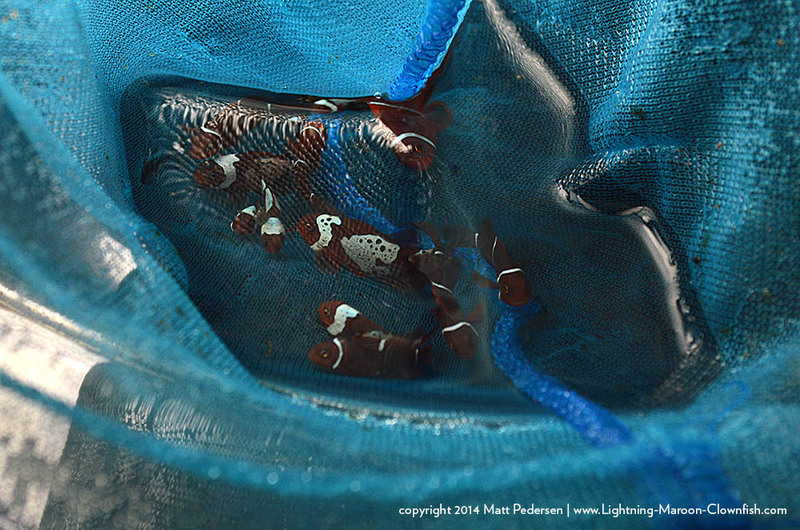 I took the opportunity to do a headcount on Spawn #27 as I released the group into the BRT – provided I didn’t make any mistakes, the rough split was 28 Lightning Maroons, and 24 White Stripe Maroons. Out of those 24 White Stripes, I maybe only noticed 3 that had extra markings and would fall into the “Morse Code” notion. I should point out that Mike and I discussed his rearing methodologies at great length; you’ll recall that part of the reason for allowing him to rear batches was to see if he could do any better, and my own effort to learn from him and work in collaboration. Say what you will, but the bottom line is that Mike reared spawn #27 with what amounts to a 50% water change weekly. I can guarantee I was nowhere near that on some runs. Of course, that’s not the only difference involved here…his methodology was to drain the standalone BRT half way each week, and gradually fill it back up over the course of the week, and then repeat. It seemed like a very manageable system, and frankly it should be obvious that good base maintenance will get you good results. There are still some deformed fish, but if I have to be honest, I think he reared a superior batch than the first big one. I’m going to look into segregating them out, as well as stepping up the water changes overall, as that can only help produce superior fish. It’s interesting to note that the sizes do vary immensely within the group, whereas the group of 10 I had going from around the same time is more homogeneous in size and has more patterning, and is comparable in size to these. It will take a lot of really specialized research to hone in on some of the variables in play, but I look forward to doing that if I’m able. Mike’s routine is hardly surprising – my breeding of Angelfish relied strongly on 50% weekly water changes, and based on published recommendations, while I took 3-4 months to hit market size doing 50% weekly water changes on growout, if I had stepped it up to 50% daily water changes, I would have cut my growout time down to 6 week! Think about that. Back in June, we (I, Blue Zoo Aquatics, and Sea & Reef Aquaculture) announced an unprecedented raffle contribution to the Marine Breeding Initiative (MBI) in recognition of the 5th Annual Marine Breeder’s Workshop, which is coming up quickly on July 19th, 2014, in Bloomfield Hills, Michigan. 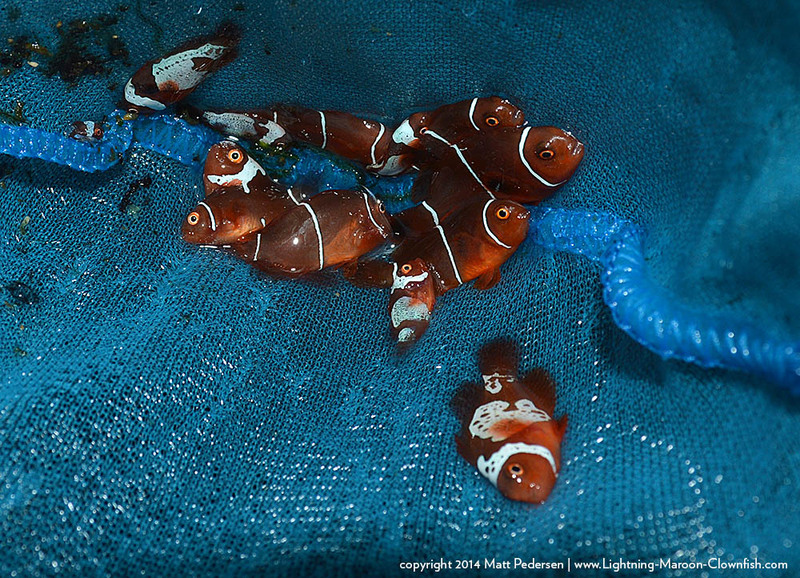 In short, Blue Zoo and I contributed one of my holdback Lightning Maroon Clownfish, Sea & Reef contributed two F1 Morse Code Maroons from unrelated PNG Bloodlines to get one to pair with the Lightning Maroon, and Blue Zoo Aquatics footing the bill to ship the resultant pair to the winner within the continental US after the workshop. Well, the first hurdle has been seen, and passed. 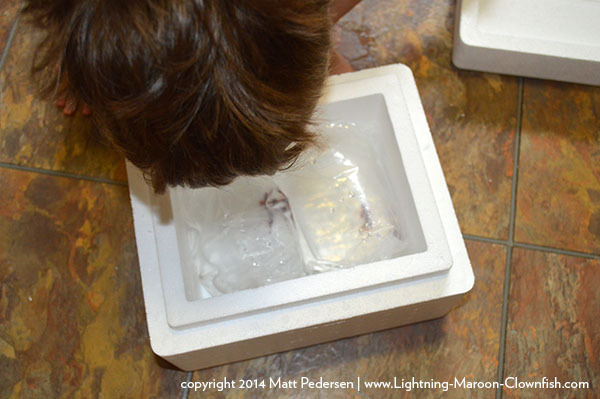 On Wed., June 18th, Soren Hansen of Sea & Reef Aquaculture shipped out two select Morse Code Maroons from Maine, to Duluth, MN. In a turn of events that I think has never happened to me before, poor weather somewhere along the route caused UPS to fail to deliver the package that Thursday. 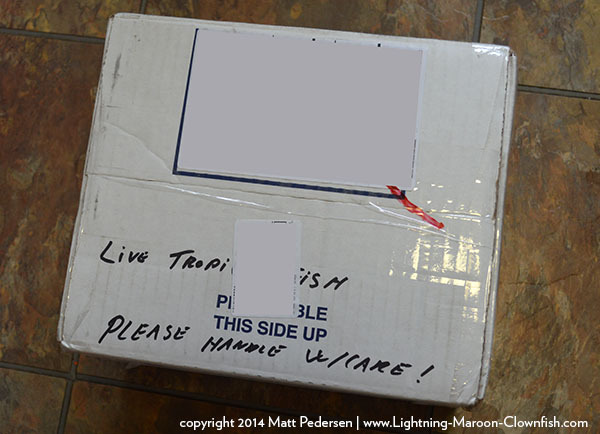 Soren and I were quite anxious to see what was in the box when it finally arrived on Friday, June 20th. 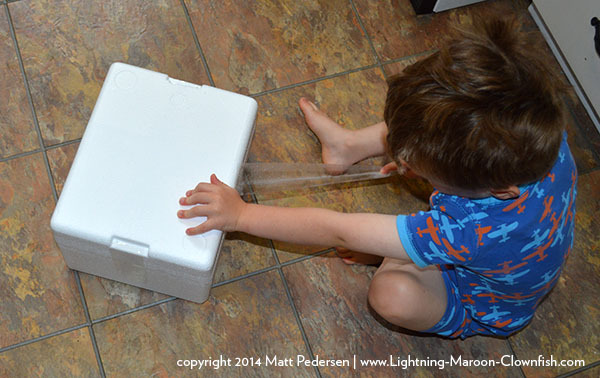 My son, Ethan, was eager to see what was in the box too! 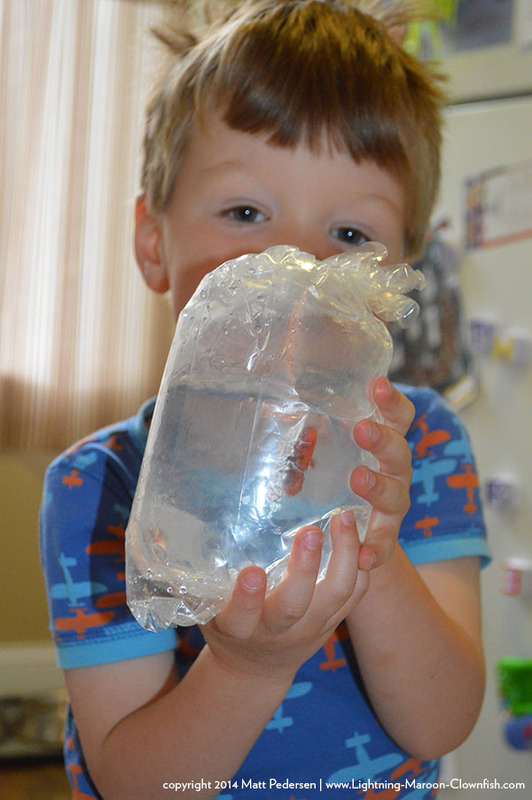 The moment of truth – was it a box of dead fish, or had Soren’s packing stood up to the challenge imposed upon the fish? Yes, that was Soren just going 2 for 2, successfully shipping fish an extra day without issues. 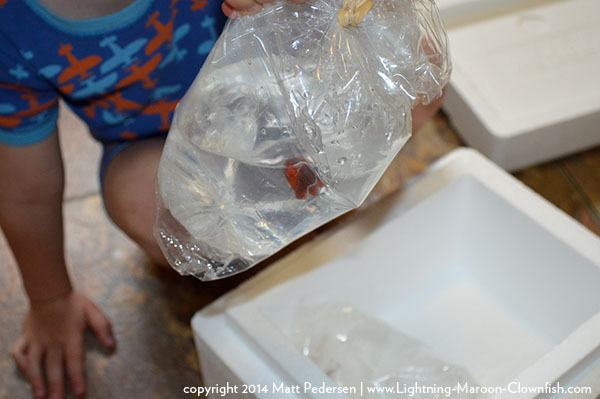 The fish were honestly a little stressed out from the extra time in the bags. 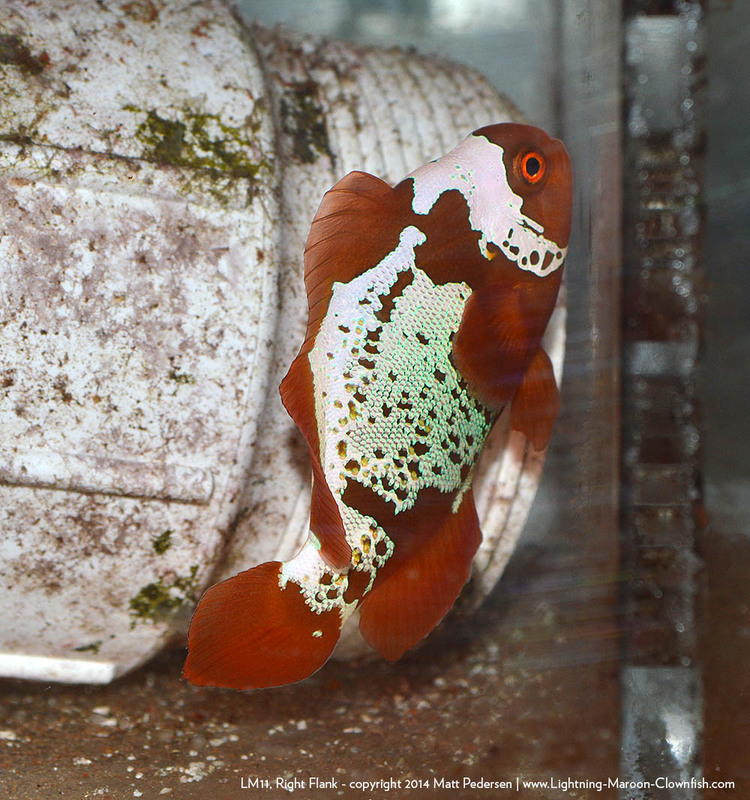 Both were placed into a 5 gallon bucket with a fair dosing of ChloramX to neutralize ammonia, and then were drip acclimated to reside a cube that had, for months, held my White Stripe X White Stripe holdback pair. Initially, I thought I might pair up the smaller one with the holdback Lightning Maroon (MWP3), so for the first few days it was given the freedom to explore the main tank. Meanwhile, the larger Morse Code Maroon was acting a bit jealously. Every time I walked up to the tank, this was what I saw. The best part? 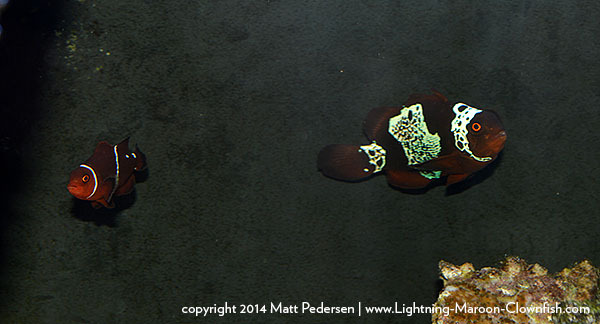 24 hours after releasing the larger one, I allowed the Lightning (MWP3) to join him. So far…not a single bit of bickering whatsoever. They don’t sleep together yet, but they don’t bicker or fight and they are indifferent about each other’s presence. Therefore, it’s hard to say that they’re a bonded pair, but they are 100% on the road to more solid bonding in the days, weeks, and months ahead. 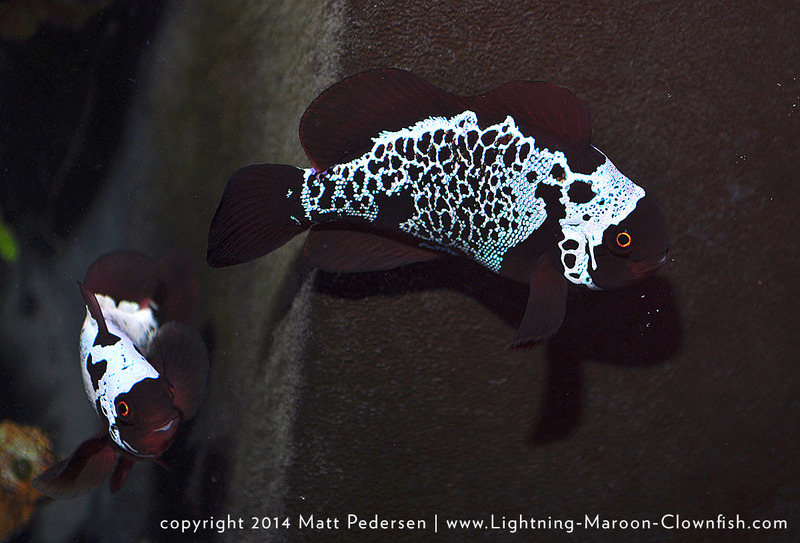 So, barring any changes or unforeseen murders, this will be the pair of fish up for raffle at the MBI Workshop! 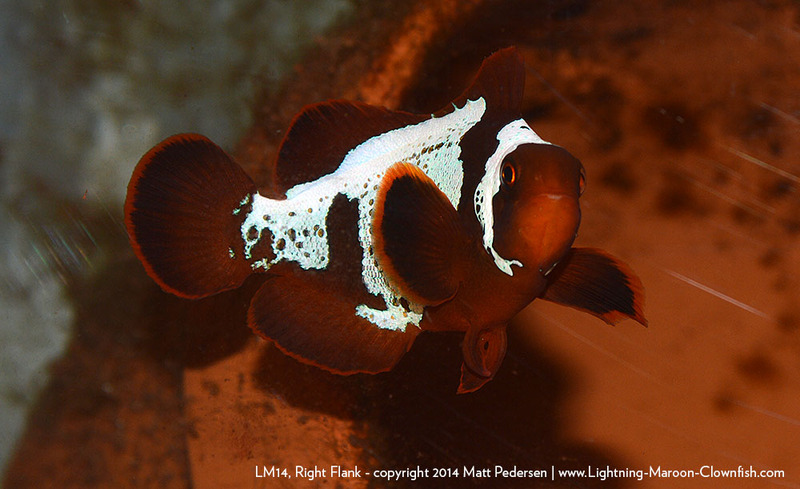 Lightning Maroon Clownfish Auctions Underway – What’s Left? 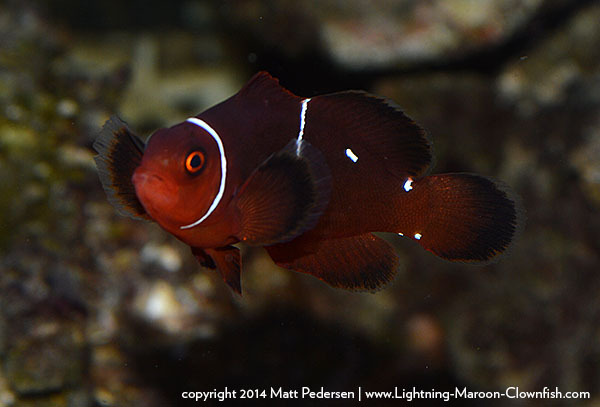 A look at the Lightning Maroon Clownfish available for purchase by a winning auction bid! 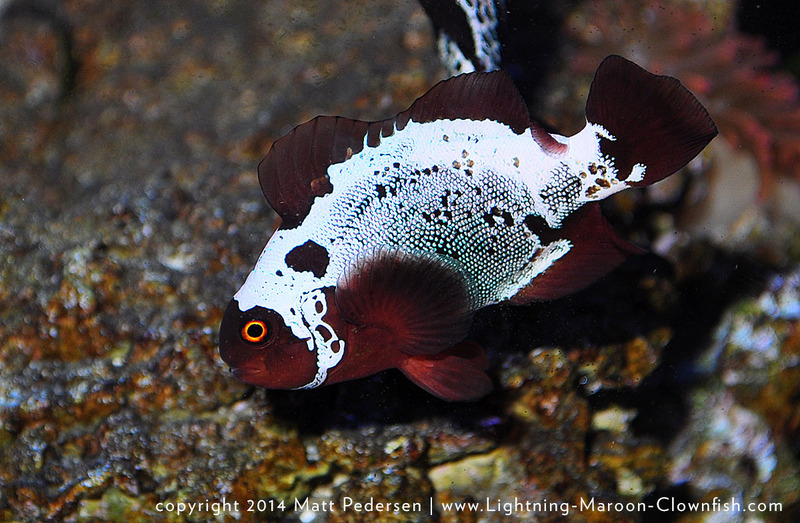 4 Auctions, 5 fish (including a PAIR) are available right now! 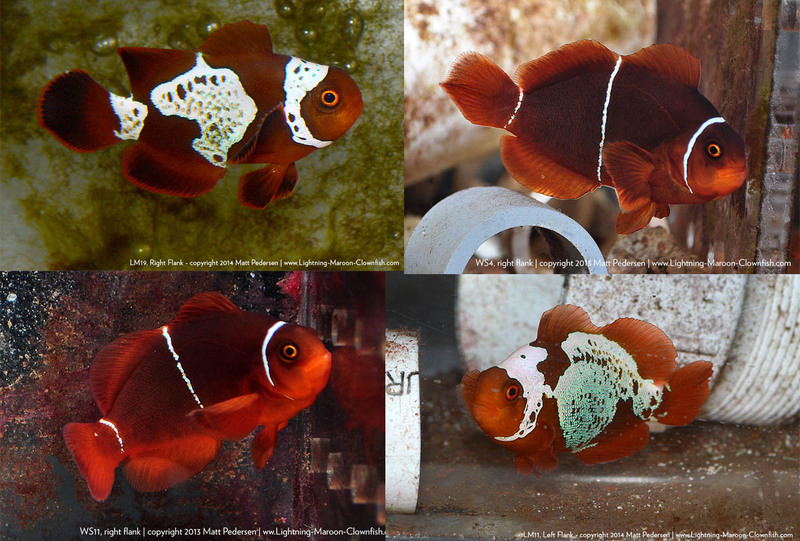 After that, a look at the 6 fish that remain for the Summer 2014 crop (after which, there won’t be any more to offer until fall or winter)! What’s left for summer 2014? Not much, so start hatching your plans. 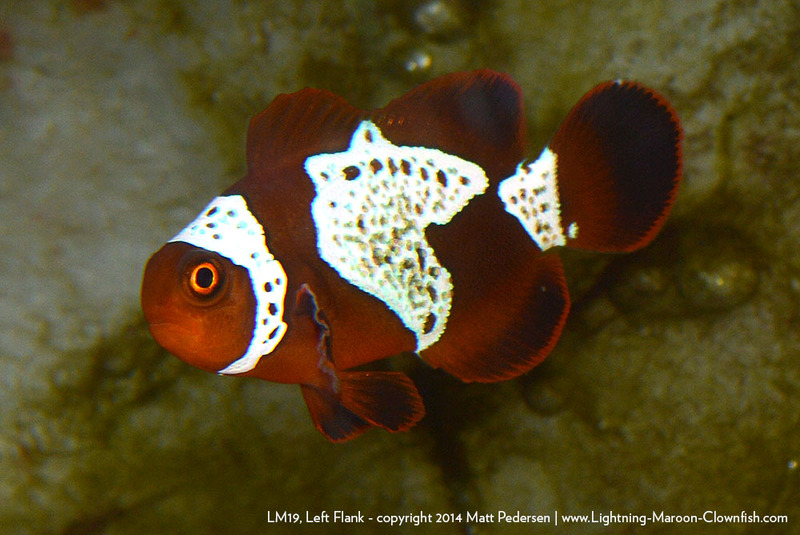 LM9 – the first Lightning Maroon Clownfish to be offered at auction for 2014. 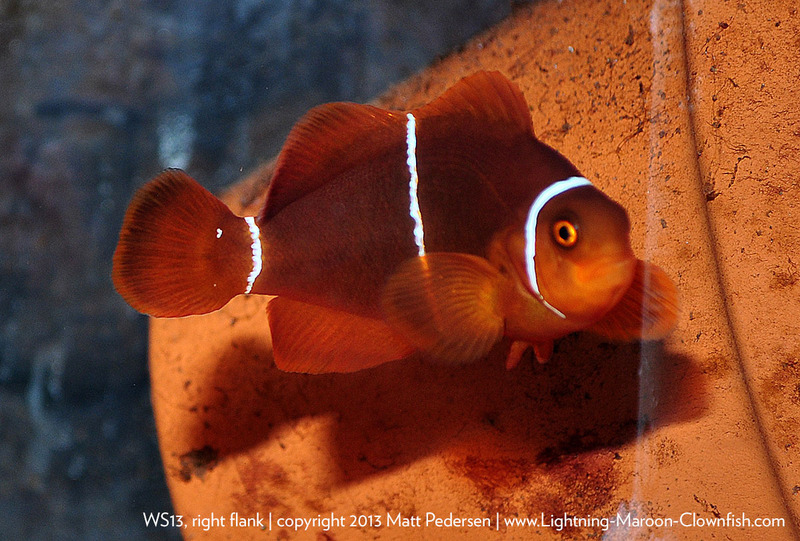 “Summer is here and it’s time for the next wave of Lightning Maroon Clownfish to hit the market. It’s been about 6 months since the last wave hit and these truly remarkable fish from Matt’s first and second spawnings are ready to ship to their new homes. 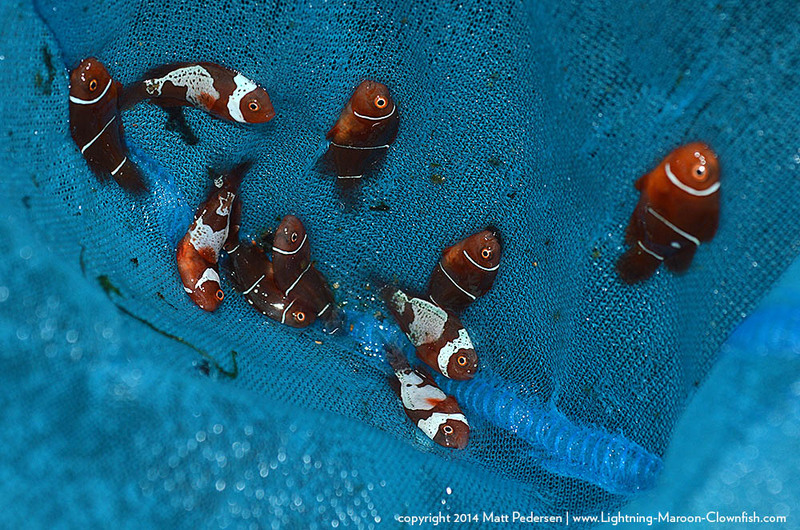 After nearly 3 years of toil, trouble and extreme dedication, breeder Matt Pedersen is proud to offer to the US market the next batch of these truly remarkable fish. 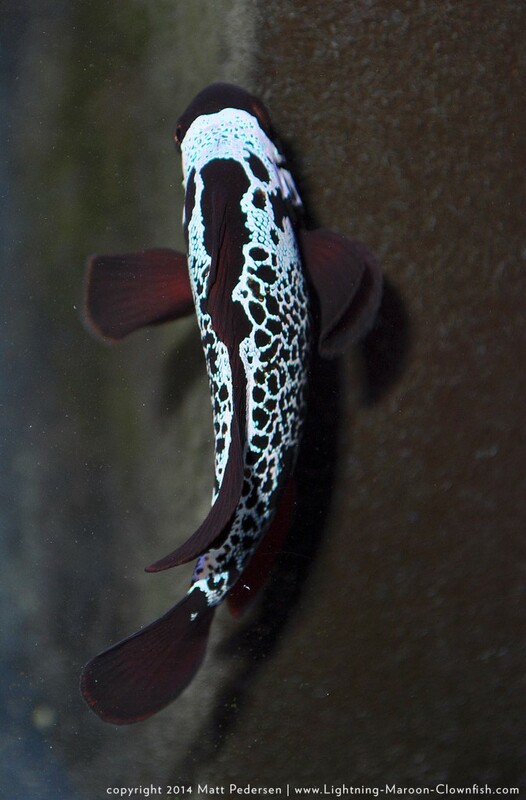 For those discovering this amazing animal for the first time, please click HERE to familiarize yourself with the extraordinary journey that has taken place to bring these fish to market. These next 5 will be auctioned off in 3 individual fish eBay listings. The last two in this wave will be sold as a bonded pair. 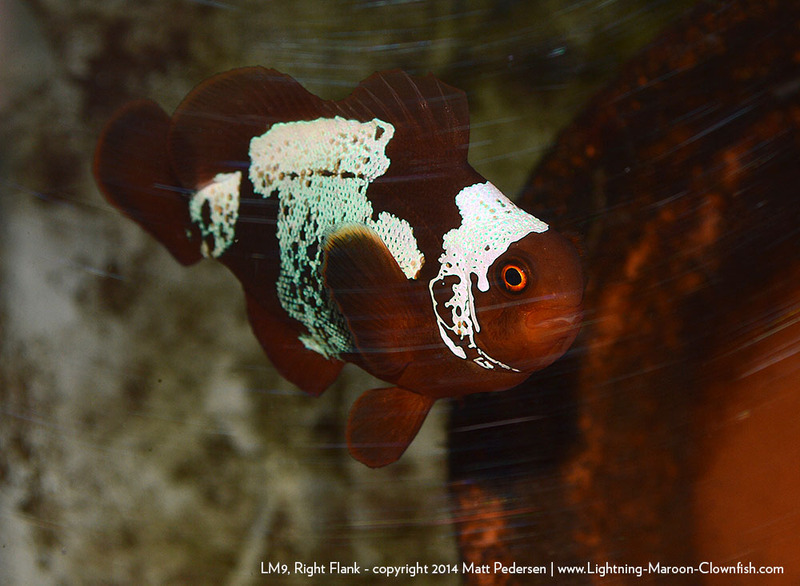 The first auctioned fish, LM9, is already up for bids. 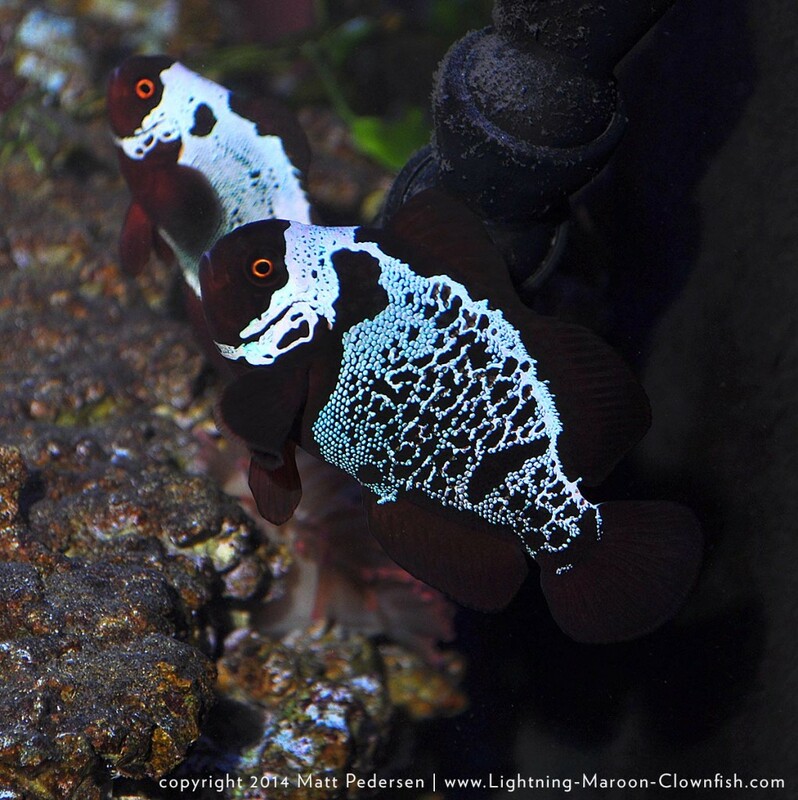 And for those who’ve been following my updates, it’s not hard to figure out which fish will be sold as the “Bonded Pair” (ok, it’s LM17 with LM18 - UPDATE #3 – they are now at auction too). I’ll keep the identies of the last two fish secret for now [UPDATED - LM14 is now also up for bid! - UPDATE #2 - WS13 is also now up for bid! 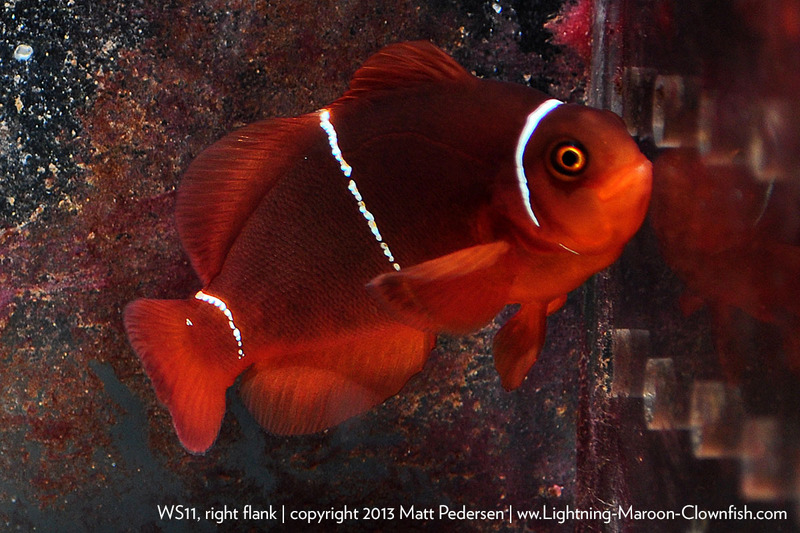 ], but you know you can rule out MWP3, as that fish has been donated to the MBI Workshop Raffle this year! 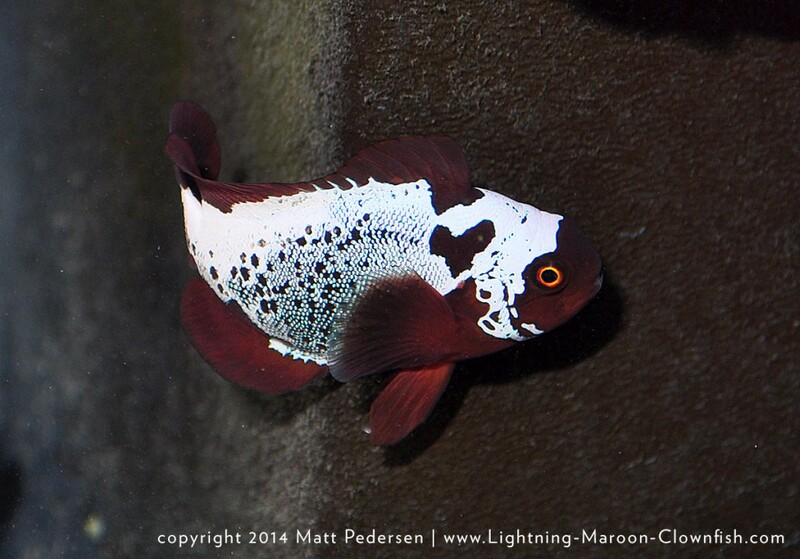 2014 MBI Raffle to Feature Lightning Maroon X Morse Code Pair! The 2014 MBI Workshop presents a SHOCKING RAFFLE made possible by Blue Zoo Aquatics, MiniWaters LLC, and Sea & Reef Aquaculture. In recognition of the 5th annual Marine Breeder’s Workshop, and the accomplishments made by marine breeders globally, we present a shocking once-in-a-lifetime raffle drawing! 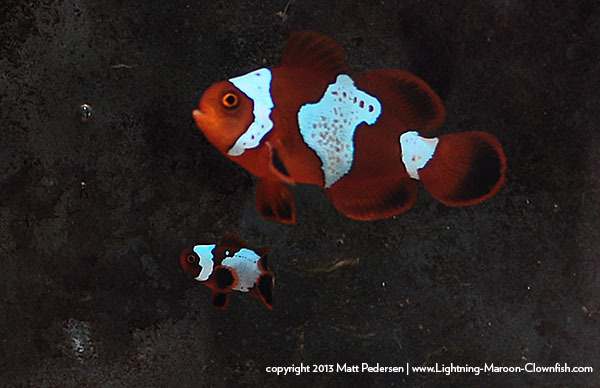 One lucky winner will recieve the F1 PNG Lightning Maroon Clownfish, MWP3, shown here, donated by Matt Pedersen (MiniWaters LLC) and Blue Zoo Aquatics, paired with a F1 PNG Morse Code Maroon donated by Sea & Reef Aquaculture, shipped from Duluth, MN by Blue Zoo Aquatics to any destination in the lower 48 US states after the 2014 MBI Workshop! Raffle tickets are only available at the workshop – MUST BE PRESENT TO WIN! 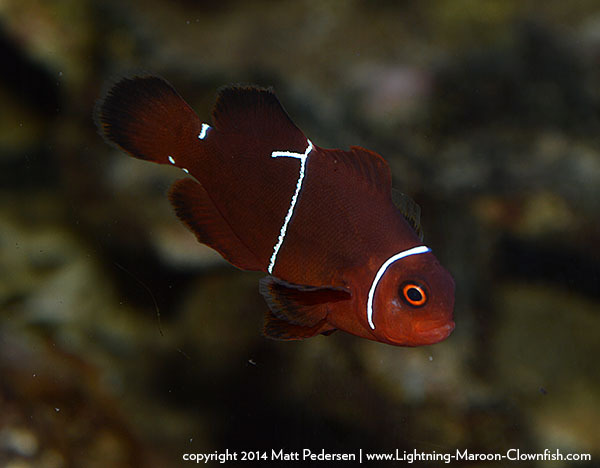 I totally neglected to share this here – Jake Adams came to visit me back at the end of January, 2014, and we recorded an interview that focused heavily on designer clownfish, including the Lightning Maroon. There’s some great video shot by Jake that you won’t see anywhere else, so dive into ReefBuilders The Show (aka. just “The Show”), episode 2, and enjoy. 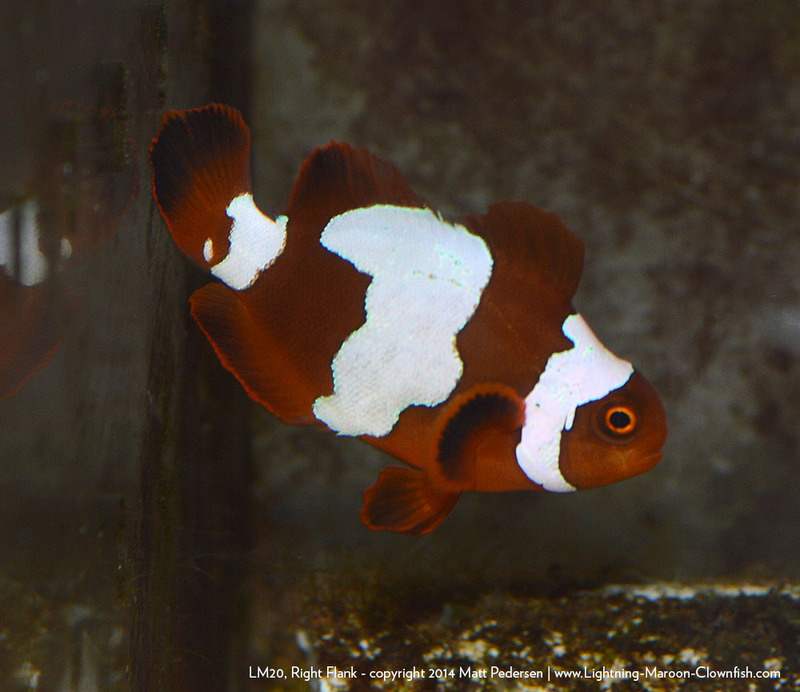 Let’s start with Spawn #34 – as of Sunday morning, 6/15/2014, there were a lot of dead eggs on the bottom of the tank, but when I gave the eggs the viability test (touch them and see the larvae wiggle inside) they were actually still alive. I pulled them and placed them in a specimen cup with vigorous aeration – none of them hatched, and through the course of the afternoon they all died and came off the tile. So spawn #34 has wound up being a bit small, but there are probably still 50-100+ offspring in there. Seeing the larvae live for days behind the initial hatch HAS made me reconsider whether I am perhaps having egg quality issues, and more specifically issues that cause hatching problems. In talking with fellow breeders like Mitch May (aka. Booyah, a good friend from back home in Chicago), he of course raised the same concern with me, but when we talked diet, that ruled out the problem. Still, this could be a case-by-case thing, so it’ll be interesting to me to see if I can change this. 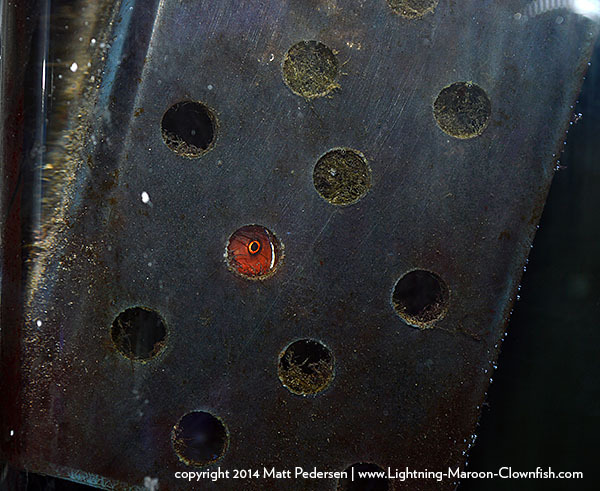 One of the annecdotes that Joe Licthenbert always instilled upon me was “if you want good eggs, feed the fish eggs”. Time to call up Rod Buehler of Rod’s Food and see about getting a fresh shipment of Rod’s Eggs up in here! Spawn #35 was laid on Father’s Day afternoon, 6-15-2014 – if all goes as is typical, it should have the first hatch night on the 21st, going into the 22nd. 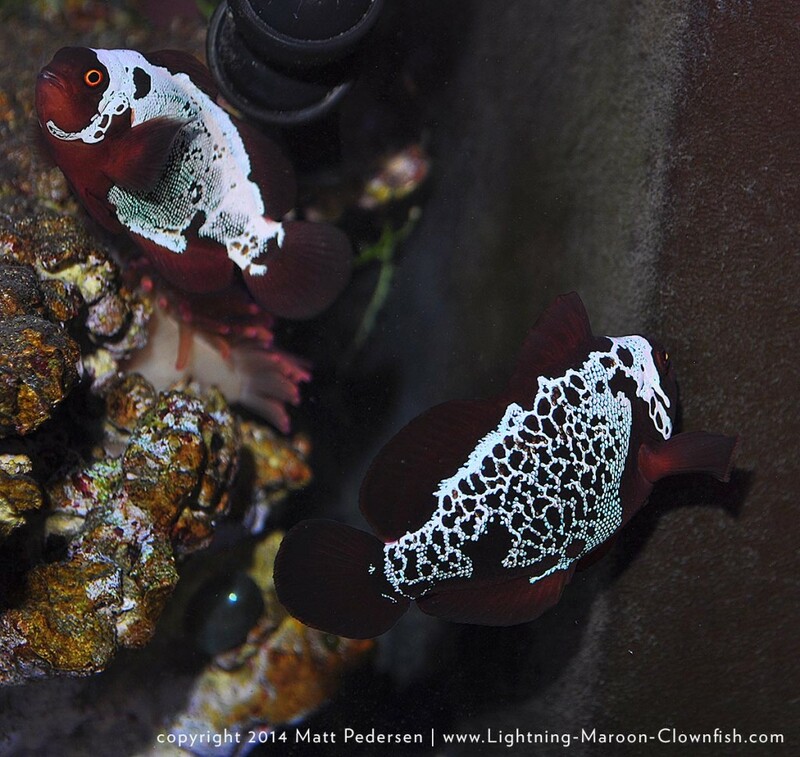 And finally, it’s been too long since I posted these – updates of the holdback Lightning Maroon Pair, the fish I’ll call MWP1 and MWP2. They’ve been in the Ecoxotic tank for a while now and are solidly paired. What I hadn’t really done is take closeup shots to update the pattern progression photos, and wow am I glad I finally did. There are some big changes in both fish (but it’s been almost 6 months). The largest change I noticed is in the headband of the larger fish, the female I’ll be calling MWP1 and have been using for the pattern progression photos. Where her headband had been mostly solid white for all these years, it has finally seen the first pinpricks of red spotting come through. Knowing how these spots grow and evolve, it is fair to say that her once “boring” headband will now become an intricate latticework of pattern…in another 6 months or a year. I’ll post the photos in just a second, but here’s the interesting thing. If it has taken this long for the pattern to get this far, I wonder if the pattern development can be used to gauge the age of their wild mother. 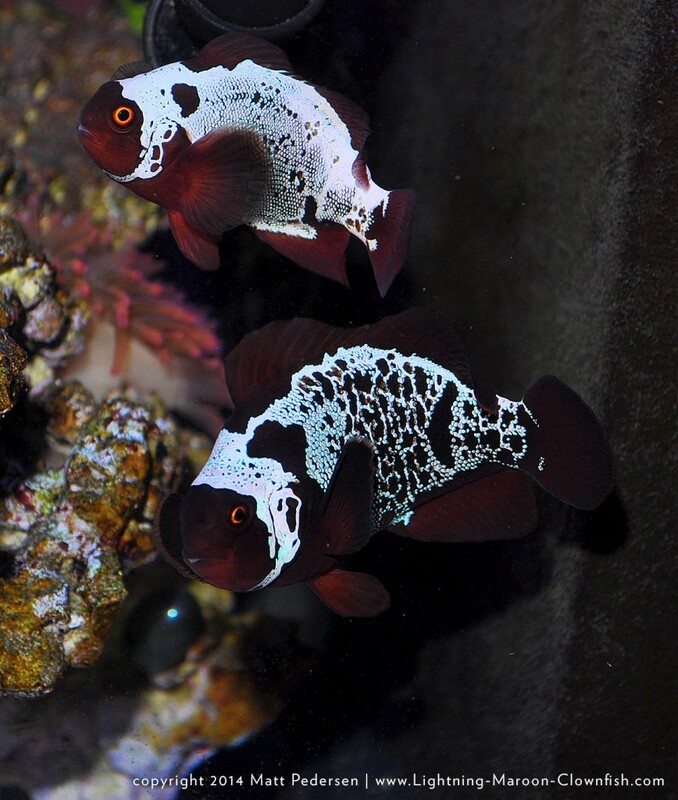 As we’ve seen the pattern evolve, certainly it may hit a point where it truly feels analogous to mom…presuming the fish in my care grow and develop at a similar rate to the wild (a big presumption) then I feel that yes, it could give some insight into mom. 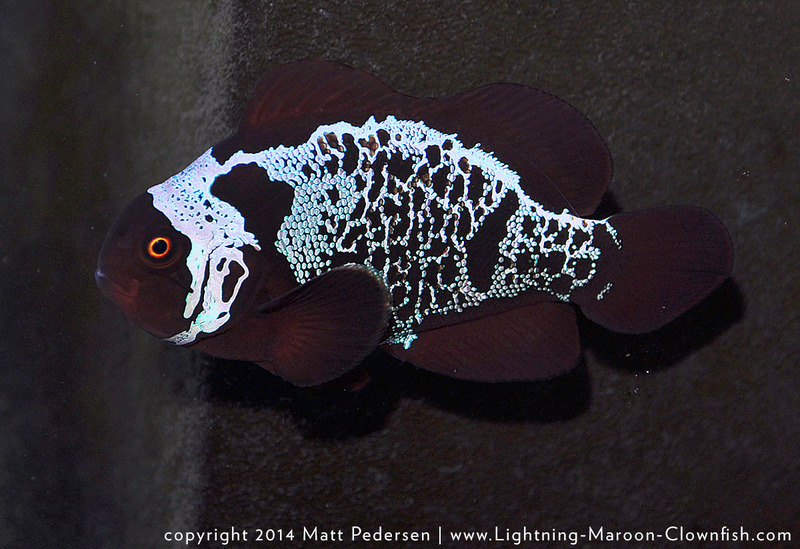 After all, we know that wild-type Onyx Percula offspring can continue to develop coloration and pattern for 3 years in captivity (which is why I never produced any great numbers of them) and now here, with the Lightning, I think my hypothesis that the pattern development takes years is unfolding before our eyes. Look at the OTHER one, MWP2, the one that for all this time has until recently had solid white flanks. It too, is finally turning. I find this incredibly fascinating; if the speed of pattern development cannot be easily improved upon through selective breeding, it could mean that all Lightning Maroons will be a bit of a diamond in the rough. You may have to buy one and wait for it to develop over time. 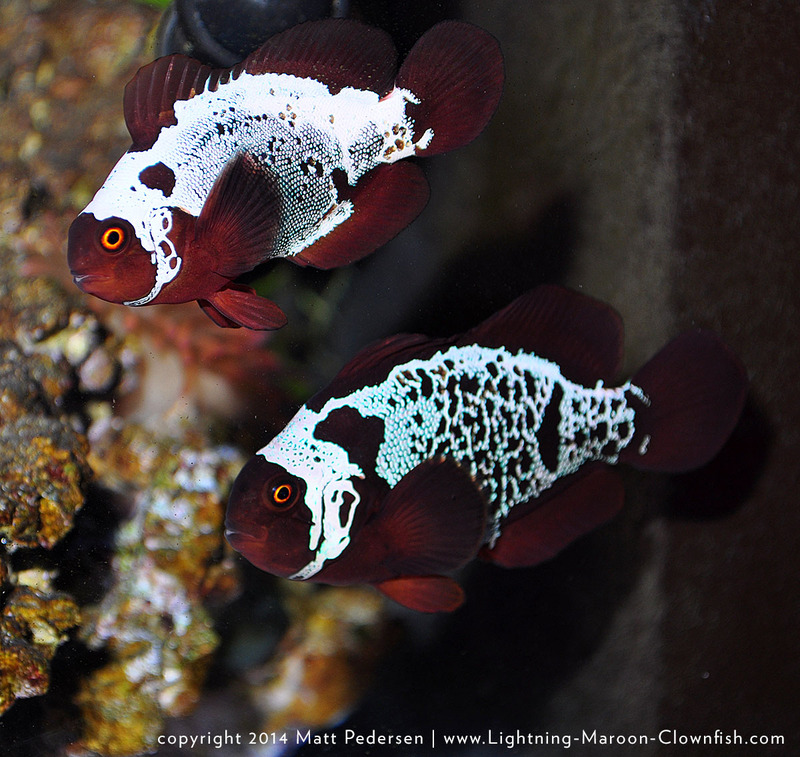 I wonder too, will there then be a huge premium placed on older fish, who are showing more well-progressed pattern? I could see this happening given that to this day, a well colored Onyx Percula which may be a year or older, will always fetch more than a partially barred, partially colored up juvenile. 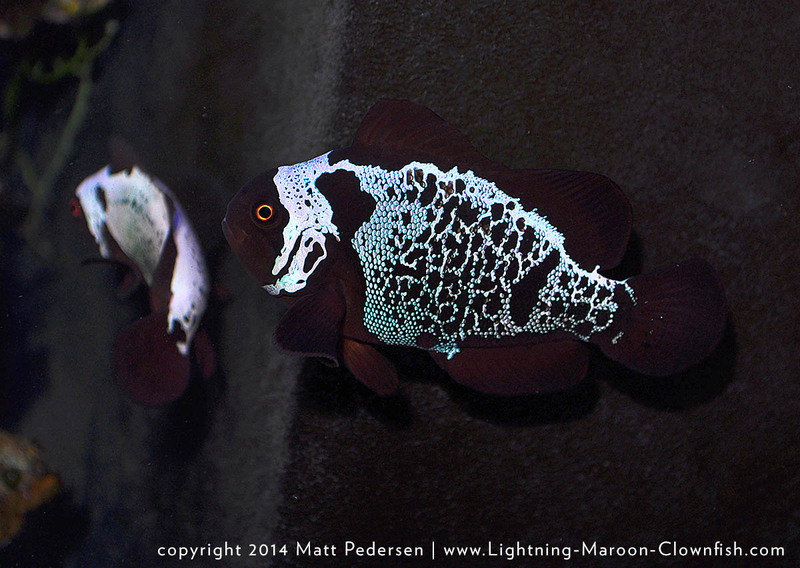 Here’s some photos I shot last night, Father’s Day, June 15th, 2014, of MWP1 and MWP2. I also have some other photos and such I need to post…I think I skipped some things over the past few months!